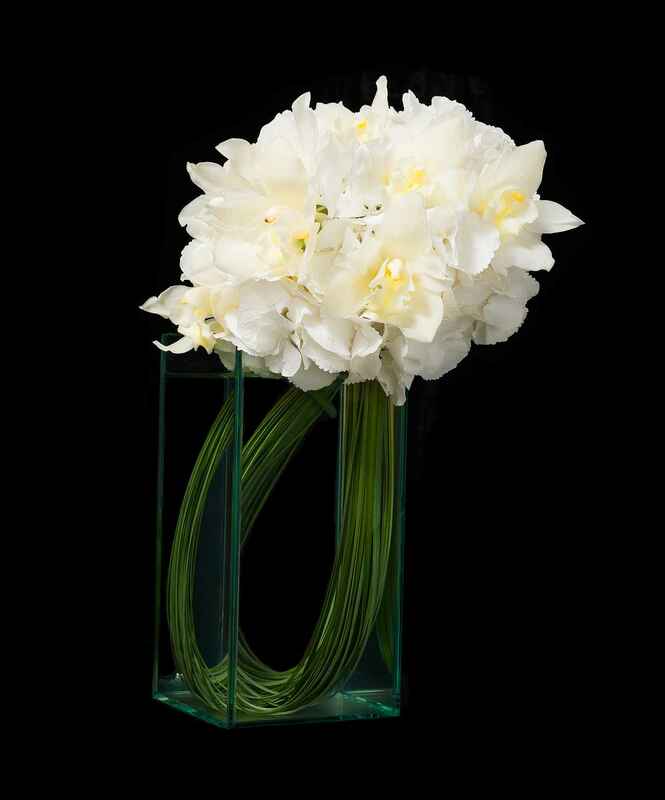 A beautiful marriage between white hydrangea and white cymbidium orchid displayed in vision glass to create a perfect illusion. Our flower shop loves to come up with new creative ways to make floral arrangements for wedding flowers and celebrations that are only limited by our imagination. We love the brilliant-white robust blossoms of the hydrangea and imagined how well they would mix with white cymbidium orchids. When we place these two together, we are very impressed with how well they look together as a floral pairing. The choice of a vase is just an important part of the floral arrangement that floral designers must consider. One of our favorite type of vases to use are those made from clear vision glass. You can see the corners of the glass vase framing the design and giving it support. The rest is crystal clear to give an unobstructed view of the floral design. When you look at this design carefully, you will notice that your eye naturally travels in a circular motion as it takes in the entire style of the design. The green grass encourages your view to go down from the white flower blossoms and then follow the grass curve to go back up. This is part of the wonderful illusion that makes this arrangement so visually exciting. We enjoy when we can buy flower varieties that normally would not be put together and then mix them in such a decorative way. Our goal is to buy flower NYC residents want and then help make their weddings, parties, and other events spectacular. If you want to buy the best orchids in NYC, then look no further. As one client says, “This is the best flower shop near me NYC has to offer for our immediate needs and future plans. We call on them all the time.” Make your next event memorable and order our orchids in NYC today!